Saturday we left the Devils Marbles to head to Alice Springs. It’s a long drive, with not a lot along the way, but we did stop at the centre of Australia!! Below, the boys are standing next to the Stuart Memorial at the centre of Australia – as Stuart calculated it using a sextant. More recent calculations, using different techniques have yielded other locations, but we’ll stick with this one for now!!! 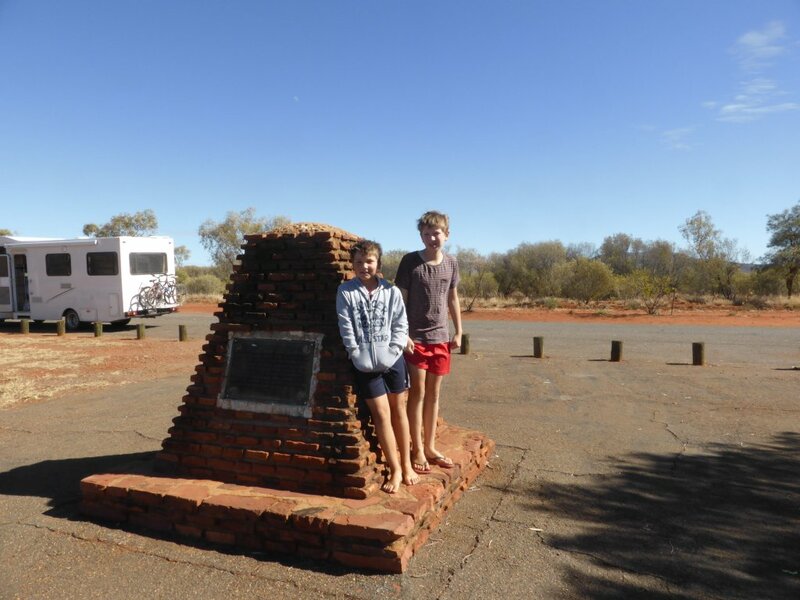 Jonathan and Daniel at the Stuart Memorial at the centre of Australia! If Jonathan is looking a little uncomfortable, it is because he was…. It has gone cold again! The weather has been all over the place – when we first headed out from Brissy, the weather was fine. Then at Longreach, about a week ago, it got really cold for a short period. One night I actually got out of bed to change out of my summer PJ’s and into something warmer, despite a blanket and quilt. ABC news the following morning talked of record low temperatures in Brisbane, and a quick look at the BOM site indicated it had got down to -4.8C in Longreach! No wonder it felt cold! That didn’t last long though – it was back to summer PJ’s after 1 or 2 nights. It started getting hot during the day also – felt hot wearing a singlet under t shirt. Then the last couple of nights it’s been getting cold again (but not as bad; -1C at Alice Springs this morning), not helped by a cool breeze. So who knows what will happen over the next week…. though I gather from talking to people that this is quite cool for here. Oh, and a hint – if you want to look up the BOM info for Alice Springs, don’t start by going to the QLD tab on their website – like I automatically did…. About 130km’s out of Alice Springs, the motorhome suddenly started making this compressed air hissing noise. Initially I thought it was a tyre deflating, but the hissing was dependent on the engine revs and load, which was unusual for a tyre…. A quick check confirmed no tyre problems, so we continued a few more km’s to the next roadhouse. Of course no mechanics in the area (not surprising given my population estimate of 2 people), and even if there was they wouldn’t be working on the weekend. I was told the same would apply in Alice Springs too. Oh, and no mobile coverage either, for another 100km’s or so…. The motorhome was still drivable, though low on power at higher revs, and no other obvious problems (temp fine, no smoke etc etc). I figured it was something relating to the turbo and the pressurised inlet gas escaping, and probably not critical, so we trundled the remaining 130km’s into Alice Springs in top gear at around 75km’s per hour (to keep the revs low and minimise load on the turbo). A few people in Alice confirmed the same – no mechanic’s open Sat arvo – wait till Monday – and oh, they are pretty busy too so hope you aren’t in a hurry… Great, just what we need…. Alice Springs is rather different than what I had imagined. I’d expected a town on a large flat desert type scenario. Instead it is actually located kinda within the MacDonnell Range, and you actually drive down into the valley where the town is located. On the south side of the town, the range towers tall and steep, with a small gap for the road south to Adelaide. Steep and rocky, I wouldn’t call it lush, but there is vegetation on the hills. So we pulled into our first caravan park stay for the trip – the Big4 on the southside of Alice Springs. We stayed the night there, and will do the same again tonight. The boys are enjoying it – they have one of those big jumping pillows, and there are lots of kids around. The bikes are off the rack, and they are having fun. We don’t even have to keep an eye on how much water we use – there is a tap right next to us! Oh, and of course we have phones and internet again! They even had a pancake morning today – free pancakes for breakfast! They must have made a thousand of them, as the park is quite busy. Tomorrow it will be off to the mechanics, for a quick and easy repair I hope 🙂 Got to find one that will look at it quickly for us. There is a Ford dealer and service centre in town – not sure if I should go there or go independent (usually I’d avoid them, but probably be better in a country town)? My internet research suggests its probably something relating to the the EGR, piping or the inlet manifold, in which case nothing too major. We’ll see! This entry was posted in Equipment, Places by Simon. Bookmark the permalink. Hope it is a quick ,not expensive fix for you. We are enjoying following your adventures very much. We walked up to the Anzac lookout whilst we were waiting on the mechanic, and yes it is a nice view from there. Thank goodness easy fix! suggestion for a most incredible walk….. go out to Serpentine Gorge and walk up to Counts Point. When I did the Larapinta Trail (19 days) in 2012, this was a most awesome veiw. Otherwise walk up Mt Sonder, the boys would do it andvery very special. Enjoy Central Aus. Thanks Kathy. We were out there today (and yesterday arvo) and only just got back to Alice Springs and internet access (and saw your comment)! We did visit Serpentine Gorge – beautiful, and we did walk up to the look-out. Not sure if that is Counts Point?